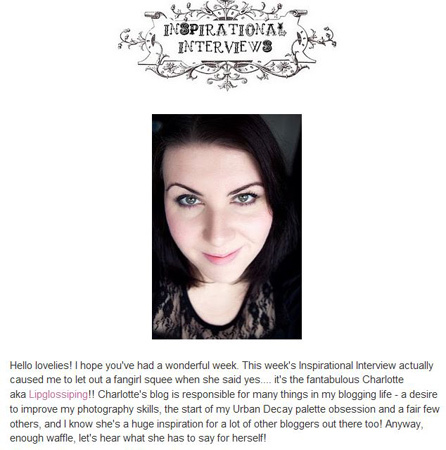 …here’s an interview I did with the lovely Emily from Sparkle and Shade. You can check it out if you’re looking for something to fill a boring morning with… I can’t promise it’ll make it any less boring though! Well, what a whirlwind the last 4 days have been! I’ve been up and down to London more in the last week than I have in months and then I headed off to Paris on Saturday with the infinitely good-humoured VexintheCity! I didn’t spend as much money as I feared I might but what I bought, I’m very happy with. I shall do a little Paris post later this week. I’m playing catch up with emails, comments and posts so please bear with me and if I’ve missed a question (either by comment or email), do chase me up. Lovely interview! Lipglossiping was my first ever blog to follow.And now i’m addicted to it! Your awesome sense of humor and all the awesome pictures are responsible! Love Love Love Lipglossiping!